As you must have worked out by now I hate to waste food. This was an impromptu ‘using up’ meal; I had some white crumbly cheese which my parents left with me before they went on holiday, plus some spinach and ham which my lovely lodger had not managed to finish off before she went away for a few days, and would not have lasted (don’t worry, I will replace it!). A very cheap and yummy lunch for a wet, stormy Sunday. Bring the pasta to the boil. Follow the instructions on the packet; not all pasta takes the same length of time to cook. While the pasta is cooking, crumble the cheese, rinse the spinach and shred the ham into small pieces. Drain the pasta and add a splash of oil and the oregano. Next add the ham, spinach and cheese and put the lid back on the pan so that the spinach wilts, the cheese melts and the ham heats through; the hob does not need to be on at this point, it should have enough residual heat from cooking the pasta. After a couple of minutes add some black pepper and give it a good stir. Serve with a sprinkle of chilli flakes. It is over two weeks since I posted this taunting photograph with the Leftovers Soup, and I have finally got around to writing the promised (and much requested) recipe. Apologies for being a bit slack. I usually use ½ wholemeal flour (i.e. 4 oz Wholemeal Plain or 4 oz Wholemeal Bread Flour). If you do not have plain yogurt, milk can be used instead but make sure that you start with a much smaller volume and work up to the correct texture. Sift the flours with the salt and bicarbonate of soda and then rub in the butter. Add 225 ml / 7½ ml of the yoghurt all at once and mix quickly to make a soft dough, adding the additional yogurt only if necessary. Shape into a 15 cm (6 inch) diameter ‘cake’ and place it onto a floured baking tray. Score deeply with the back of a knife into quarters. Brush with beaten egg, then grind some salt and pepper onto the top. Seeds can be added at this point if you have them. Bake in the centre of the oven for 30 minutes. This soda bread is best served fresh from the oven. 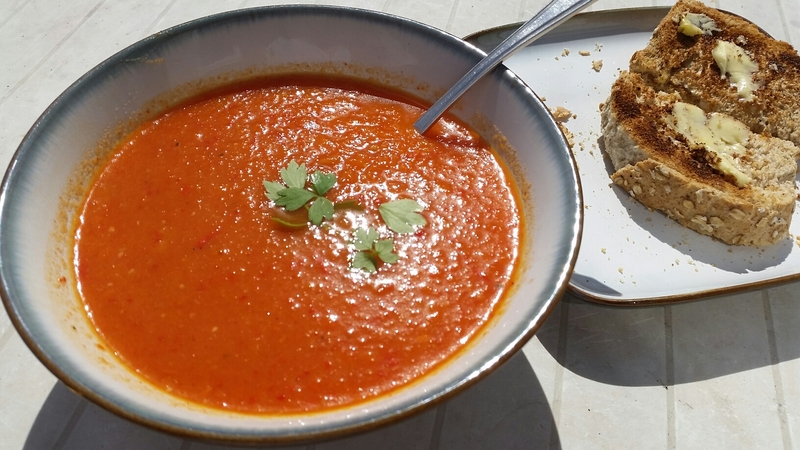 Enjoy with some nice butter, cheese and a lovely soup – such as this rather yummy one! It’s time to use up the rest of the carrots before my next shop, so it’s soup time again! This particular pot of soup fed me for two meals. Peel and chop the onions and carrots and cook in some olive oil (just enough so that they don’t stick) along with the spices for about 5 minutes, keeping an eye on it and stirring occasionally. Add the cider and cook on a medium heat for another 5 minutes. Add the lentils and stock and simmer on a low heat for 10-15 minutes, adding more liquid if required. Transfer to a blender and whizz until smooth, adding almond milk until the soup is nearly the right consistency. Pour the soup back into the pan, using some more of the almond milk to swill out the rest of the soup from the blender so you don’t waste any. Bring the soup slowly up to temperature. Taste. Season with salt and pepper and serve.